Microsoft's October-announced, February-launched Surface Pro has been doing the critical rounds of late, to mixed reviews. Folks love the fluid Windows 8 interface and the device's power, but they're not so enamoured with the bulky weight of the hardware, or the diabolical battery life. On the other hand, Lenovo's ThinkPad 2 is a complete reinvention of the ThinkPad – one that cashes in on the great features of its predecessor while moderately re-styling to avoid its flaws. But which is the best tablet? Find out in our review. The ThinkPad and the Surface Pro are immediately distinguishable from one another based on their relative heights. Though each occupy the same footprint, the Surface Pro is slightly over 50 percent taller, at just over half an inch. It’s also heavier, weighing in at two pounds to the ThinkPad’s 1.2. The AC adapter adds just over half a pound to the Surface Pro’s total carry weight: for the ThinkPad, this is around a fifth of a pound. There’s no doubt about it: the ThinkPad appears much, much more mobile-friendly. The Surface Pro doesn’t really carry off the tablet look particularly convincingly: we found ourselves instinctively looking for a hinge to open the non-existent clamshell. The thin air outlet around a third of the way around the edge of the device is also an oddity: although the fans are pretty quiet, it feels odd to have the occasional gust of warm air over your palms. That said, the Surface Pro’s VaporMg bodyshell and slim port design do add a certain elegance to the whole thing, even going so far as to give it a lightness that’s just not there on paper. The ThinkPad, on the other hand, fits the archetypal Windows tablet mould. The corners are rounded, and the left-hand side of the device is bevelled to hide a stylus. It feels solid and expensive in your hand – though not quite as ‘premium’ as Apple’s tablets – and the display, which has a native resolution of 1,366x768 pixels and In-Plane Switching (IPS) display technology (for increased viewing angles and colour accuracy), does a magnificent job. The Microsoft Surface Pro is a meaty machine, packing a laptop-sized Intel Core i5 processor as standard and 4GB of DDR3 RAM. That makes it very, very fast, even for graphically intensive tasks such as running Adobe’s CS6 suite. On the other hand, the ThinkPad 2 draws its computational ability from an Intel Atom processor. This means that battery life is much extended – Lenovo claim a full charge will last around nine hours, which is roughly accurate. The Surface Pro, under heavy fire, can only output a two-hour working day. If you’re mobile, the ThinkPad is the obvious choice. Of course, the differences in components should mean that the Surface Pro is much more suited for heavy professional use, but in reality the performance gap is far less measurable than we expected. Perhaps because both devices see bottlenecks at their respective Solid State Drives, there’s little difference in light application performance (Internet Explorer 10 functions similarly on both devices, as does Office). Some third-party apps (Netflix, Google Chrome) struggled a little on the ThinkPad, but this was likely down to optimisation issues which will work their way out as the Windows 8 platform evolves. Both the Surface Pro and ThinkPad 2 benefit tremendously from their respective custom keyboards. The ThinkPad 2’s keyboard is a brilliantly-made dockable affair, turning the best tablet in to a laptop with next to no hassle. The Surface Pro’s keyboard selection comes in two main flavours, with the physical-key ‘Type’ cover infinitely preferable to the impractical ‘Touch’ cover. Both ‘Touch’ and ‘Type’ covers offer a fully-functional trackpad, something lacking on the ThinkPad 2’s keyboard dock. All these peripherals are wireless, too, which avoids the hassle of cabling. 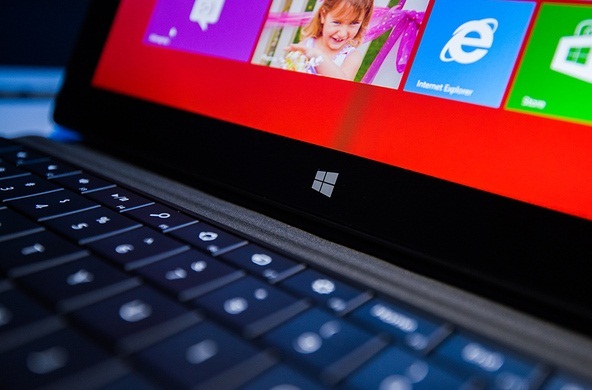 The Surface Pro and the ThinkPad 2 sit at the top of the Windows 8 tablet field: both are prime examples of where the genre is headed. Both feel fantastic to use in real-life applications, and both come with a solid lineup of useful peripherals. Price-wise, there’s little to distinguish a base-level Surface Pro from a kitted-out ThinkPad 2, but it’s worth bearing in mind that any Surface Pro owner will have to shell out a few additional pounds to cover the cost of either a ‘Touch’ or ‘Type’ cover. With this in mind, we recommend any mobile user to seriously consider the Lenovo ThinkPad 2. As a tablet experience, it feels wholesome and familiar. The Surface Pro, while an impressive feat of engineering, artful design and subtle flair, is too heavy to play the tablet well. It cannot output a tablet-like battery life. It has fans. While these are small problems, they’re sufficient to give the Lenovo ThinkPad 2 the edge – for the time being.